I love Ole Miss sports. Really. I do. I often joke that my top three loves in life are God, my family, and Ole Miss sports. And the Rebels climb the list, based off how they are doing. Someone once told me that it looks like Oxford threw up in my office I have so much Ole Miss stuff in my office. When I was ordained into ministry, Holly gave me a framed panoramic view of Vaught-Hemingway Stadium (for those that don’t know, Ole Miss’ stadium). So, as you can see, I love the Ole Miss Rebels. I remember as a high school senior going with some buddies watch Ole Miss and LSU play in Tiger Stadium. I think it was 1993, and both teams were not very good. Ole Miss was either going on probation, or coming out of it, I’m not sure, and LSU was the not the giant that they should have been, and are now. LSU crushed us, by the way. It was fun. You haven’t lived until you’ve been cussed at by someone granny for bring your Ole Miss stuff into Tiger Stadium. That’s what we did. We brought our red and blue, our hats, our colors, and our Rebel flags. 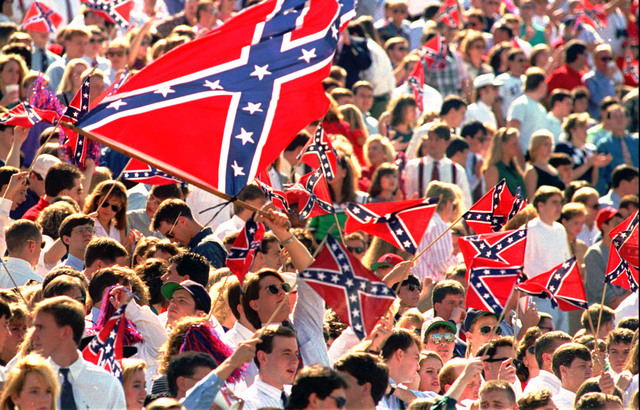 Yep, this was before Ole Miss banned the sticks that the Confederate flew on. Not the actual flag, but the sticks that they flew from. So, there we were, in the upper deck of Tiger Stadium, watching our Rebels lose, flying our flags, and pulling for the Rebels. I really do love the traditions associated with Ole Miss. I love “From Dixie with Love.” I love Hotty Toddy. I love hearing the band play Dixie after the game. Those things, even now thinking about them my heart race and make me excited. But, I also understand the complications of things like the Rebel flag. And Dixie. I understand it in a “big” picture level. And I understand it on a personal level. I have many friends that are African-American (usually there is a but that follows that, huh?) and I understand the pain that mane of the symbols cause, even when 9 times out of 10, they are not invokes with any malice in mind. And, even in my own life, I understand it. The issue of race is never as it seems. I am the son of a woman that was half white and half Hispanic. My grandmother married a man from Ecuador lived there for several years, and her two children (one of whom is my Mama Sarah) were born there. After my grandmother divorced her husband, she returned to home, in the 1950s with two children of, yes, let’s say it, mixed race. And she raised her kids, loved them, and taught them right from wrong. 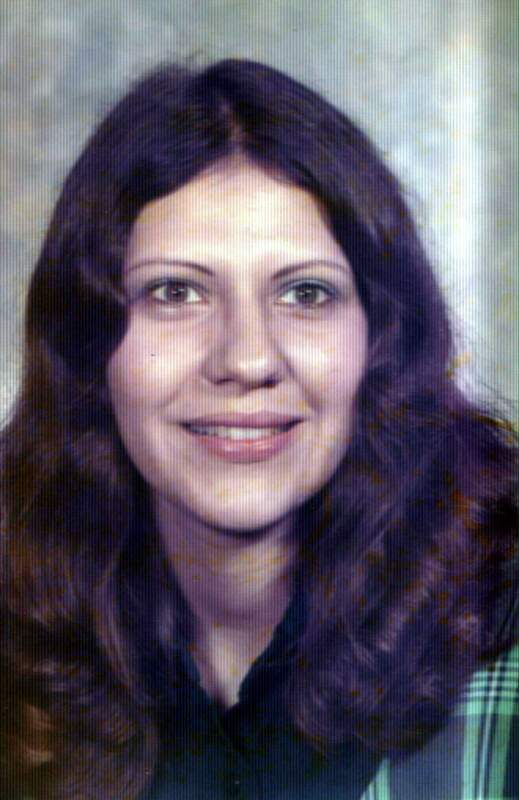 Her daughter Sarah was my mother, who was murdered, and then I too, was raised by my grandmother, just as my mother was. Race is a messy subject, isn’t it? Things are never as they seem. And so, even in my life, I understand my heritage and understand where I came from, and understand than in matters of race, thing are often confusing and messy. And because of my background, I understand, so some small extent, the pain that symbols can cause. I had a friend that used to forward out racially charged emails about Hispanics, and one day I turned to Holly and said, they don’t realize it, but they are basically talking about me. Because, my mama was was half Hispanic. And one thing a southern boy doesn’t take to is someone talking about his mama. So, this friend simply thought he was forwarding on a email. See that’s how it works. I’m a guy that’s a quater Hispanic who’s grandfather (as best I know) is still in Ecuador somewhere. And I consider myself a southerner. I have often wondered, though, if others would consider me southern, if they knew my family history. And all that said, I still get misty eyed when Pride of the South Marching Band plays from “Dixie with Love.” And I still love the heritage of my favorite school. And I hope (against their mom’s wishes I’m sure) that my kids will go to Ole Miss one day and we can all tailgate in the Grove together. And watching the Ghosts of Ole Miss brought all this back to me. I don’t really know if there is a moral to these thoughts, or even a purpose. I just know that for many of us here in the south, this is our story. I am 36. There has never been a time in my life where life hasn’t been fully integrated. I have always, my entire life, had African-American friends. I truly believe that my children are being raised by us (and our school, community, and church) not to see race. At Asbury (and all of my churches that I’ve servered) raise isn’t an issue, I truly believe that we do the best to love everyone, as Christ would have us to. And for me, as a pastor, the issue of race is a hill that I’m willing to die on. Thanks, Andy. Lynn and I watched the documentary the other night and remembered our own heritage. Lynn’s dad was among the National Guard who protected James Meredith. Our lives are shaped by the stories of our heritage. Thanks for sharing yours. Keep writing! Thank you Bishop. Man, I like typing that. Praying for you, Lynn, and your ministry in TN. I know you are being a blessing to them. Thankful for you and what you mean to my life and my ministry. You are correct! When my Daddy (the late Erle Johnston of Forest) traveled the US and in Mississippi…his platform was that integration was the law…and we should all accept the law. He was called an integrationist, segregations, and other uncomfortable names. He was one of six Directors of the State Sovereignty Comission…and I have always felt that his book, which dealt with many, many issues, should be the Mississippi History Book in high schools across our wonderful state. Yes, there was the ‘naysayers’….but there will always them around. And she knew what she was talking about! Bro. Andy, you have truly blessed my soul today! To God be the Glory! If our world would simply not look at race and simply treat and respect others, this world would be so much better. Born in East St. Louis, IL. Graduating from Blue Mountain College, working for Mississippi State University and a daughter attending Ole Miss – my race relations and reactions have been overwhelming. Through it all, I love every person and my golden rule is treat people with respect and as long as I get it back I can deal with anyone. May God Bless us all on this journey of life, Keep me in your prayers and we miss you in Ripley, MS. Wanting to have that “Perfect Peace”!